Samuel Adrian Baugh was born on March 17th, 1914 in the backyard of the enemy, in Temple, Texas. The son of a railroad worker, young Sammy Baugh spent countless hours throwing his favorite projectile through a tire he'd suspended from a tree. When he grew tired of it, Sammy would set the tire swing in motion, and practice hitting the sweet spot as it made its wide elusive arcs. When he'd mastered that, he'd practice hitting the moving tire on the run. Sammy Baugh grew up to be a quarterback. And what a quarterback he'd be. When Sammy turned 16, his family packed up and moved to Sweetwater, Texas. It was there that Baugh played his first organized football, and excelled at any number of sports. Ironically, it was his baseball skills that netted him a scholarship at Texas Christian University and the nickname 'Slingin' Sammy'. Sammy was the consummate athlete, playing baseball and basketball for the university, but it was his prowess with the football which was to earn him fame. In 1936, Sammy's junior year, he put TCU on the college football map. Led by Baugh's rifle arm and heady athleticism, the Horned Frogs went undefeated through their first 10 games, and went on to win the Sugar Bowl 3-2 over LSU. Baugh made his mark not only as a quarterback, but was a fine defensive back, and punter. In the 1936 Sugar Bowl, Baugh picked off two passes, punted the ball 14 times averaging 48 yds per kick, and reeled off a 44 yard scramble to seal the win. Baugh's senior campaign was even more impressive as he led the Frogs to a 16-6 Cotton Bowl win over Marquette. Baugh was so dominant in the game, his coach Dutch Meyers sat him for the final quarter to avoid embarrassing the opponent further. Baugh finished out an impressive collegiate career having completed 285 of 597 passes for 3,471 yards and 39 touchdowns. Coach Meyers was to impart many enduring lessons to Baugh, instilling in him an appreciation for the short to mid-range passing attack. 'Anyone can throw it long and miss' was Meyer's philosophy, but the secret to a feared attack was mixing the run with a brutally accurate short passing attack. And Baugh was his guy. Meyers served as Baugh's baseball coach in addition to his football duties, and would later coach another NFL great, quarterback Davey O'Brien. 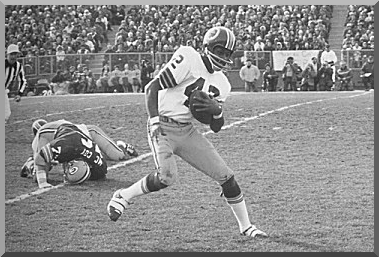 Sammy's first play in a Redskin uniform was a 30 yard kickoff return at Griffith Stadium. Amazingly, in his rookie season the 6'2", 180 lb rookie quarterback led his new team all the way to the NFL Championship game. There, on a brutally frigid and wind-swept Wrigley Field, Baugh put on a passing clinic. In an NFL where passing was viewed as a novelty and was endorsed grudgingly, Sammy made believers out of all who watched that day. Passing for 335 yards and completing 17 of 33 passes including touchdown passes of 55, 78, and 33 yards, Baugh led his fledgling team to a 28-21 victory. Baugh briefly flirted with his childhood dream of being a professional baseball player. He was signed to play for the farm team of the St. Louis Cardinals, but quickly found he lacked the hitting skills to make a go of it. And back to football he came, pausing briefly to marry his childhood sweetheart Edmonia Smith, with whom he would have 5 children. Baugh and the Redskins would meet their nemesis the Chicago Bears three more times in championship games in the early 1940's, including suffering a now infamous 73-0 drubbing. Following that game, Baugh was asked if one of his passes dropped in the end zone on the Redskins first drive might have changed the game. Baugh replied wryly 'Yeah. It would've been 73-7'. Baugh had better luck in 1942 when he again led his Redskins to a 14-6 NFL Championship victory against the Bears, throwing a touchdown pass and kicking an 85 yd punt. In 1943, Sammy Baugh led the league in interceptions (he picked off opponents 11 times), punting (averaging 46 yds per kick), and passing, but lost to the Bears in the championship after Baugh was knocked from the game with a concussion. Despite these early successes, Baugh didn't hit his stride until the 1945 season when the Redskins switched to the 'T formation'. It was only then that Sammy himself began calling the offensive plays. That year, Baugh finished the season with a 70.33 completion percentage, a record that held for many years. Baugh changed what it was to quarterback in the National Football League forever. Prior to his arrival on the scene, the forward pass was seen as only a trick or gimmick, something you did on 3rd down when you had no other choice. Baugh threw passes on every down, and he changed the course of the NFL forever. His exciting play and prolific arm made him a star, and in 1941, Sammy even showed up on the silver screen when he starred as 'Tom King Jr.' in Republic Studio's 'King of the Texas Rangers', a popular western serial. One of Slingin' Sammy's best memories came on November 23rd, 1947, when the Washington Touchdown Club sponsored 'Sammy Baugh Day' at the Redskins game vs. the eventual NFL champs that year, the Chicago Cardinals. After receiving a gift, a brand new maroon station wagon, from the fans, Baugh returned the favor, blistering the Cardinals for six touchdowns and defeating them 45-21. His playing days done, Sammy turned to coaching, first at the college level, and then as the first coach of the New York Titans (later to become the Jets). In 1962, Sammy served briefly as the coach of the Houston Oilers. In 1963, Sammy Baugh was elected to the Pro Football Hall of Fame. Last edited by Boone; 03-17-18 at 11:59 AM. Happy Birthday Sammy Baugh, wherever you might be. Remembering Sammy Baugh, greatest Redskin ever, on what would've been his birthday!